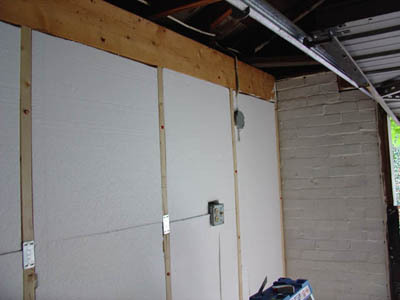 The studio loft is now entirely insulated, and so is the overhead door. It’s also just about completely covered with this foil-coated vapour barrier, and there is now so much light up there, that it looks almost livable, despite the short height of the storage space. One of my other projects is to build a small climbing wall up the inside of the studio. I left a section of floor out of the loft, and am putting in some 3/4″ plywood, and some climbing holds. First I’m going to start moving some junk from the main floor and stow it away. This will also give me the chance to photograph my paintings before I put them into storage. We’ve finished installing the new door and window in the studio. Once we get the main garage door replaced, the whole building should look a lot more studio-like, although what we’re going to replace it with remains to be determined. The insulation is just about finished and the foil vapour barrier should provide a little extra warmth in the winter months. 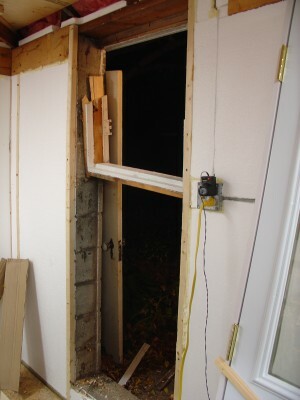 Here’s a pic of the old door frame being destroyed by me. Took the better part of an afternoon and evening to get the thing taken apart. I’m working on a few different art projects right now, each adding a more geometric design to my loose abstract style. I’ll get some pictures up when I start getting paint to canvas. Pedro Alderete was putting the finishing touches on his largest and most public piece of work � a five-part mural on the outside of a million-square-foot building at Downsview Park � when he died Monday. Working alone on a section of the mural that symbolized stewardship and included a portrait of his 5-year-old daughter, the 44-year-old artist was crushed between a hydraulic platform and the warehouse-style door he was painting. Emergency workers who rushed to the scene were unable to revive him, said park spokesman Garth Hardie. 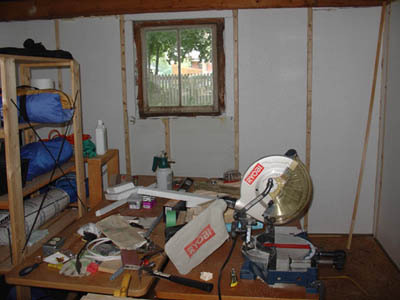 More work on the studio conversion got finished before I went to the cabin out of Longlac. 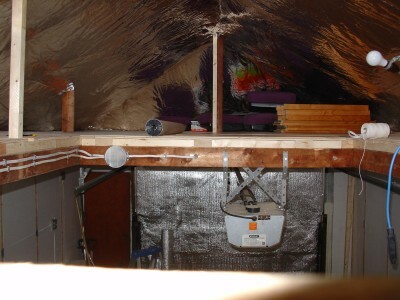 I finished the loft floor, and started insulating the ceiling. Once the insulation’s finished, I can start moving things up there, to get them off the floor of the studio. That should give me some breathing room. And once I put the vapour barrier on the walls, I can put the shelving back into place. I bought some foil-backed vapour barrier, which should add to the R-value. My door and window came in while I was away. I’m going to start installing them this week. Everything looks like it will fit properly, but I need to use concrete screws to hold them in place — the door opening is too small for any kind of framing, but the opening is just the right size for a 30″ pre-hung door. I also got my new business account in place, so I can now take cheques made out to “Zuckerloft Studio”. Now I have no excuse but to get my art out there. I’m really saddened by the closing of the KOR Gallery in Kitchener. I was just about to apply for membership there. I was literally at their door the day the notice went up. Finished insulating the soffits and clearing mouldy junk out of the loft. I started laying some more plywood flooring and stowing the “good” junk out of the path of construction. I’ve also reinforced some of the loft supports, as they look a little run down. Once the loft floor’s in place, I’ll be installing the insulation in the roof, and stapling in some 6 mil plastic as a vapour barrier. With any luck, I’ll be using the Roxul Flexibat bales I’m getting from a friend. He’s got some spares left over from a house renovation. A really nice idea came to me from the good folks at Snugglers Furniture. They are using a pressboard floor in their admin area, and the pressboard’s covered with a heavy epoxy varnish, making it look really tough. I’m using DriCore panels as a subfloor right now, but if I can varnish it, I may not need to cover it with anything. Just have to check pricing and feasibility. Here are some pics. I’ll be adding more as I go. It’s actually progessed a lot more than I’d hoped, but we’re still a long way from completion. 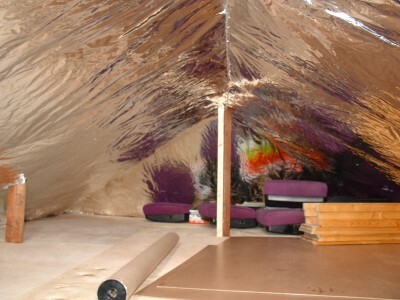 I’m currently starting to insulate the loft ceiling, so I can work through the winter. 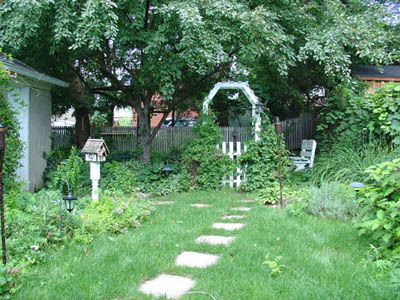 The backyard is a little overgrown in this picture. My mom and dad paid me a surprise visit and cleaned up the place. Now it looks quite presentable. The insulation is just only about an inch and a half thick, but I wanted to maximize the amount of space, since this place was a single car garage (though I’ve got pictures of the garage from before I bought the house, and I have my doubts that a car was ever stored in here). I’m contemplating leaving the exposed bricks at the front to keep an industrial look. This loft will shortly be insulated and sealed with 6mil plastic. 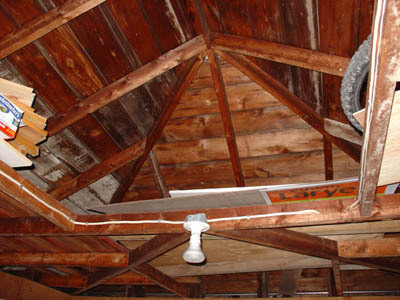 With any luck, there will also be a skylight in here. Testing… I’ve taken the same design page from elsewhere and made it a bit more unique to this particular art blog. 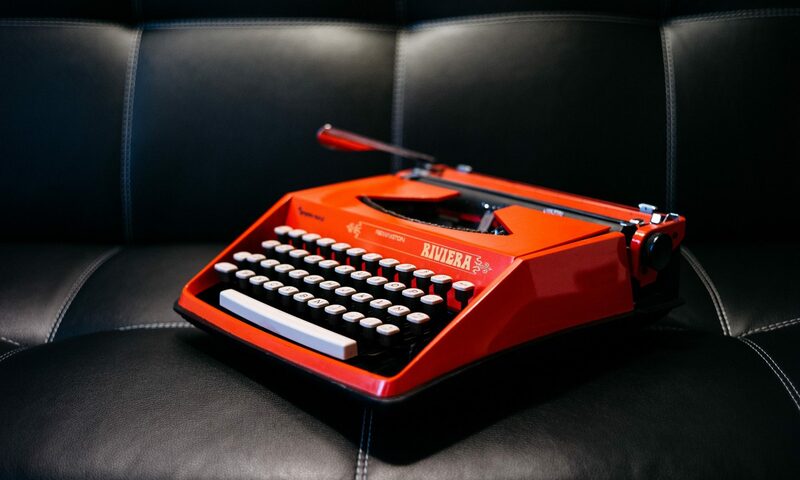 I’m hoping that this blog will serve as a starting point for those people who stumble across it — that it’s not simply a resting place for my resume or CV. I want this to be a fun and dynamic site that gives something back to the casual surfer. The links are not yet active, but once I stabilize the style and design of this site, I’ll be putting content in there. I’m testing a remote posting system from a Blackberry handheld. This new blog will focus on artistic pursuits and different projects I’m working on.